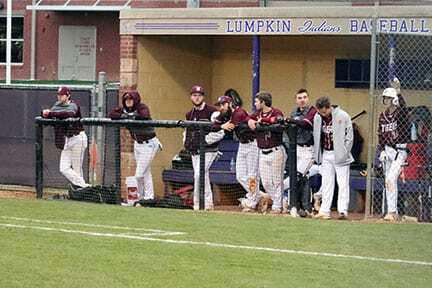 The Tigers of Dawson High School made the short trip to Dahlonega on Monday to face the Indians of Lumpkin High School in a region match up. The Tigers, coming in at 7-10 overall and 3-6 in region play, were looking to start strong and finish strong against a good Indian team. Taking the mound for the Tigers was Chandler Caine, a big framed right hander with an assortment of pitches in his arsenal. 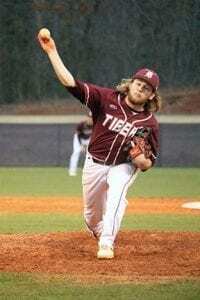 Caine went all 7 innings throwing 94 pitches allowing 1 run on 3 hits and 1 walk in the Tiger victory. Behind Caine, the Tigers’ defense was spot on committing 1 error. At the plate the Tigers offense struck hard putting up 9 hits and 2 walks and plating 3 runs. It looked as if the strategy of the Tigers was to play ABC baseball. Get them on, get them over and get them in worked well with the Tigers hitters putting five sacrifices in the book with 3 of those being sacrifice bunts. 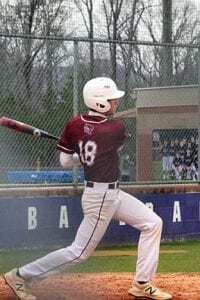 Stand outs for the Tigers at the plate: Palmer Sapp 2-2 with 2 walks, Hunter Barron 2-3 and 2 runs scored. The Tigers will host the Indians on Wednesday at Dawson High School starting at 5:55 pm.